An endocast of the A. sediba skull was created using synchrotron radiation, giving scientists a high-resolution, 3-D view of life 2 million years into the past. Photo courtesy of Kristian Carlson/University of the Witwatersrand. 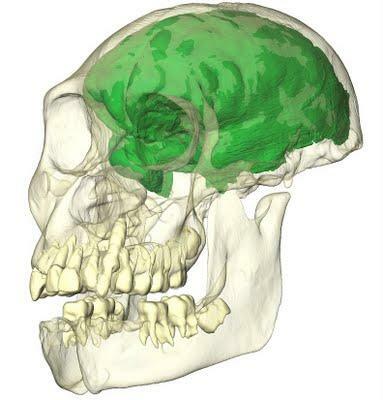 Stout is a member of the team that analyzed a virtual endocast of the skull, which dates back nearly 2 million years, to the pivotal period when the human family emerged. The resulting paper will be among those on A. sediba appearing in a special issue of Science on September 9. The new species was discovered in a region of South Africa known as the Cradle of Humanity, by paleontologist Lee Berger of University of the Witwatersrand (Wits) in Johannesburg. After announcing the find in 2010, Berger and colleagues began making the case that A. sediba may be the bridge between more primitive austropiths and the human genus, Homo. 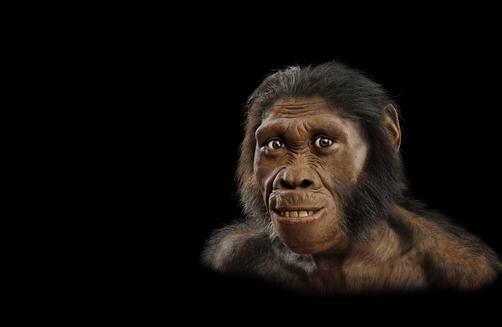 The debate over whether A. sediba is a human ancestor will likely continue, even as more material is excavated from a limestone cave called Malapa, one of the richest hominid fossil sites ever found. The brain of A. sediba can be seen in incredible detail, including blood vessels, in this transparent image of the virtual endocast. Photo by Cristian Carlson/University of Wits. The researchers estimate that the brain was 420 cubic centimeters. “That’s tiny and about what you’d expect for a chimpanzee,” Stout says. 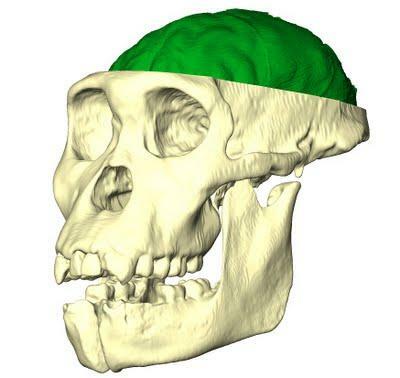 While the A. sediba brain clearly was not a human configuration, a surface bump shows possible foreshadowing of Broca’s area, a region of the human brain associated with speech and language, Stout says. “It’s a big leap, however, to go from a surface bump to really understanding what the cells were doing beneath it,” he adds. The researchers plan to expand the analysis, gathering data from more scans of chimpanzee skulls and more hominid fossil specimens from East and South Africa. “We want to put as many dots on a comparative graph as we can, to help show us where A. sediba fits in,” Stout says.